Mayor Steve Hagerty speaks at City Council on Monday. The Council discussed Evanston assistance for furloughed employees. 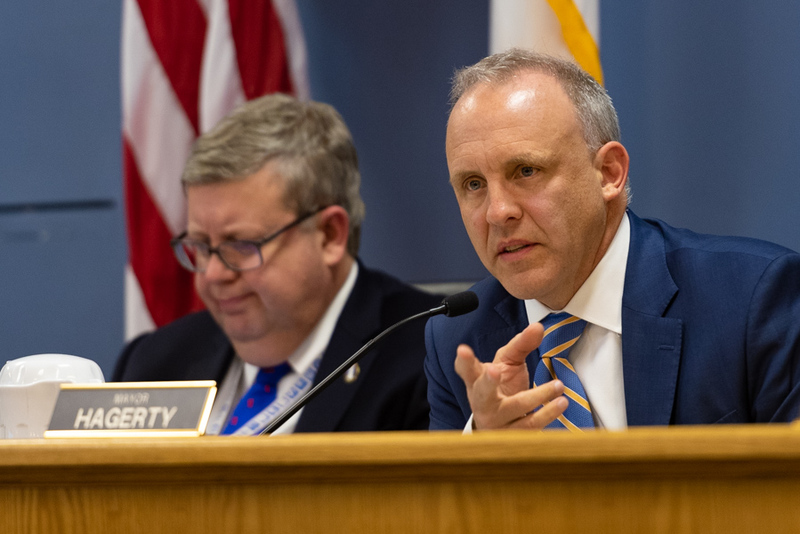 City staff announced a series of programs at a City Council meeting on Monday aimed at helping residents affected by the federal government shutdown, including access to an emergency assistance fund. As the longest government shutdown in U.S. history continued into its 24th day, Evanston officials addressed questions about funding for federal programs and assistance for residents affected by the shutdown. Negotiations between the White House and the Democrat-led House of Representatives have stalled, and they sides seem unlikely to reach a budget agreement soon. According to a Monday news release, residents employed by the federal government who are not receiving paychecks may qualify for the city’s Emergency Assistance program. Administered by the Evanston Health and Human Services Department, the program provides financial assistance for food, utilities and housing expenses. A 3-1-1 line will provide information on resources available for federal workers. Employees only need to present proof of residency and evidence that they are furloughed, which can include a pay stub or employer’s letter. In addition to furlough assistance, Sarah Flax, Evanston’s division manager of housing and grants, identified nine federal agencies impacted by the shutdown that affect Evanston. These agencies include the Agriculture Department, the State Department and the Department of Housing and Urban Development. While funding through the Agriculture Department for programs such as the Supplemental Nutrition Assistance Program, also known as food stamps, has been secured through February, Flax noted there is still uncertainty about these benefits. She said the Agriculture Department announced that February SNAP benefits will be released on Jan. 20 this year. Flax noted that over 3,300 residents work for the government, but that the number includes state and local government employees. While the exact number of furloughed employees living in Evanston is still unknown, Bobkiewicz believes that the number is manageable for the city’s programs to handle. Flax said Interfaith Action of Evanston — a nonprofit with a network of soup kitchens and food pantries in the city — can also provide furloughed employees with meal assistance. Mayor Steve Hagerty said he doesn’t know when the shutdown will end.